There are nine UNESCO World Heritages located wholly or partly in Lombardy that you can visit during your stay in this beautiful region of Italy. This church and convent is located in Milan, the second-largest city in Italy and the largest one in Lombardy. 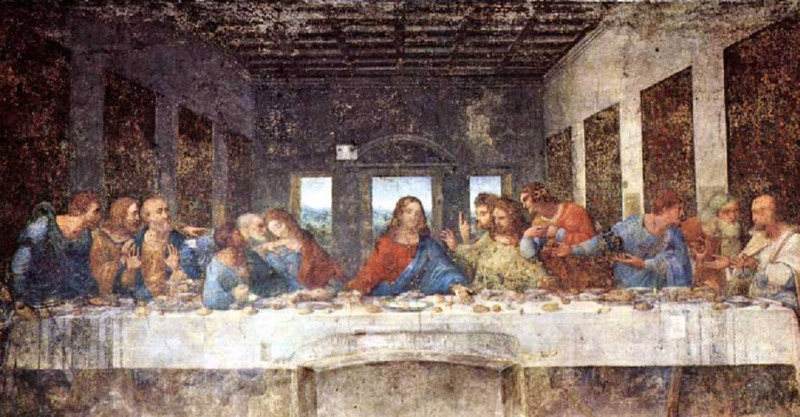 Leonardo da Vinci painted The Last Supper on the northern wall of the refectory here between 1495 and 1497. These two towns are a World Heritage since they are two very good examples of two different aspects of Renaissance town planning. Sabbioneta is a prime example of a town founded during the Italian Renaissance, while Mantua is an excellent example of how an ancient town was changed during the Renaissance to better reflect Renaissance town planning ideals. When this was recognised as an UNESCO World Heritage site back in 1979, a bit more than 140,000 figures and symbols were known. Since the, new discoveries have increased that number to somewhere between 200,000 and 300,000. Val Camonica is one of the largest valleys of the central Alps, extending roughly 90 km from the Tonale Pass to Corna Trentapassi. It is located in the Province of Brescia in Lombardy. The petroglyphs are spread out over the valley, but especially concentrated in certain areas of Darfo, Boario, Terme, Capo di Ponte, Nadro, Cimbergo, and Paspardo. If you want to see the remnants of life forms who inhabited a lagoon some 245-230 million years ago, Monte San Giorgio in Lombardy is the place to go. This place is no longer a lagoon, it’s a pyramid-shaped mountain overlooking Lkae Lugano where you can spot the fossilised remains of fish, reptiles, crustaceans, plants, insects, and more. This is a World Heritage because it is one of the best fossil records of marine life from the Triassic Period. During the 19th century and early 20th century, enlightened industrialists created new towns that didn’t just provide their workers with a place to live but boosted their quality of life by being far superior to contemporary urban housing for factory workers. Crespi d’Adda in Lombardy is a World Heritage since it is such an excellent and well-preserved example of such a company town, founded in 1878 for textile mill workers. This is a World Heritage that is spread out over several alpine nations. All in all, it consists of 111 individual prehistoric stilt house settlements created from 5,000 BCE to 500 BCE, and some of these archaeological sites are located within Lombardy. This World Heritage consists of seven groups of Longobard buildings created in 568-774 AD within and outside Lombardy. All of them represents Longobardian power over the area, and many of them also showcase the Longobard’s role in the development of Medieval European Christianity. During the 16th and 17th century, the Republic of Venice built fortifications on its inland domains in Lombardy (Stato da Terra) and on its coastal domains by the Adriatic Sea (Stato da Mar). This World Heritage consists of six fortifications spread out over Italy, Croatia and Montenegro. When you are in Lombardy, you can visit the Fortifed City of Bergamo which is one of these Venetian fortifications. On the western edge of Lake Como, you can visit Sacro Monte di Ossuccio, a hill sancturary (shrine) where fifteen chapels dedicated to the Mysteries of the Rosary were created between 1635 and 1710. The chapels were placed along a road leading to a monastery. Sacro Monte di Ossuccio is one of nine 16th and 17th century Roman Catholic holy mountain sites in Italy included in this World Heritage. When the Albula and Berenina train lines were finished and connected to each other in the early 20th century, it put an end to the extreme isolation of the central alpine villages. Today, tourists marvel at the amazing alpine landscapes that can be enjoyed while passing through the Albula and Bernina landscapes by train. Together, the Albula and Bernina lines are 128 km long and have 196 viaducts and bridges. There are also 55 tunnels and galleries – all necessary to make the mountainous and often snowy terrain passable.